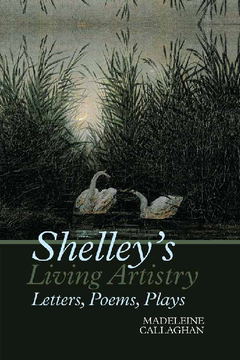 This study of the poetry and drama of Percy Bysshe Shelley reads the letters and their biographical contexts to shed light on the poetry, tracing the ambiguous and shifting relationship between the poet’s art and life. For Shelley, both life and art are transfigured by their relationship with one another where the ‘poet participates in the eternal, the infinite, and the one’ but is equally bound up with and formed by the society in which he lives and the past that he inherits. Callaghan shows that the distinctiveness of Shelley’s work comes to rest on its wrong-footing of any neat division of life and art. The dazzling intensity of Shelley’s poetry and drama lies in its refusal to separate the twain as Shelley explores and finally explodes the boundaries between what is personal and what is poetic. Arguing that the critic, like the artist, cannot ignore the conditions of the poet’s life, Callaghan reveals how Shelley’s artistry reconfigures and redraws the actual in his poetry. The book shows how Shelley’s poetic daring lies in troubling the distinction between poetry as aesthetic work hermetically sealed against life, and poetry as a record of the emotional life of the poet. Madeleine Callaghan is Lecturer in Romantic Literature at the University of Sheffield.